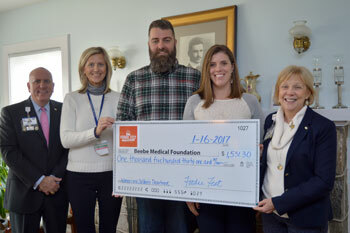 Lewes residents Christian and Julie Hudson presented a check totaling more than $1,500 to the Beebe Medical Foundation and Beebe Healthcare’s Women’s and Children’s Department. The funds were the proceeds of two 2016 Foodie Fest events held at Hudson Fields near Milton. The funds will go toward plans for a dedicated Women’s and Children’s floor in the new patient wing, said Judy Aliquo, President & CEO, Beebe Medical Foundation. Christian and Julie Hudson said they often support local organizations and have a special place in their hearts for Beebe, where all four of their children were born. For more information about Beebe Medical Foundation or to donate to nonprofit community healthcare system, call (302) 644-2900 or go to www.beebemedicalfoundation.org. For more information about Foodie Fest, go to https://www.foodiefestde.com.